Power your sales team with the confidence and knowledge to improve their day-to-day performance. 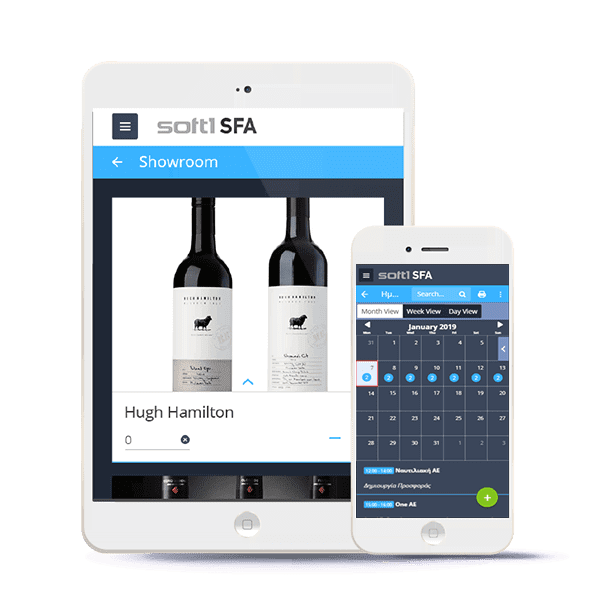 Soft1 SFA is a simple to use, yet powerful mobile sales solution delivering a vast array of features that automate and streamline all of the key sales processes so that your front-line reps never miss a sales opportunity. With Soft1 SFA, your sales people can have at their fingertips real-time customer data and insights to sell more, faster. Save your sales team time and help them streamline their workflow and shorten the sales cycles, with a comprehensive SFA solution that simplifies the performance of tasks by mobile sales people. Reduce the cost of selling, staying constantly connected to all of your customer data, so you can better sell and upsell while you properly meet customer expectations. Spend more time each day on closing sales deals in the field rather than searching through emails or compiling reports. View and manage customer information, orders and sales history on an instant, from any mobile device. View product prices, inventory and key customer sales records on the fly. Suggest and place orders, apply discounts, up-sell promotions and cross-sell related items, faster than ever before. Easily capture in-store information on any mobile device, eliminating paperwork. Effortlessly customize your schedule and route your course of client visits. Monitor and record inventory and make informed recommendations for replenishment to keep shelves stocked. Check and easily register competition related prices, manage available questionnaires and carry out on-site merchandise evaluation surveys. Forget paper and manual data entry. Automate your daily work and intuitively plan your business tasks to maximize the revenue potential of your sales territories. Plan and schedule your routes, optimize your travel time and lower your travelling costs. Gain more control with real-time tracking and location-based check-ins on scheduled routes and synchronize everything with your back-office Soft1 application. Make the most of your time while on the go. Access performance data and sales statistics per customer (such as financial reports and statements, aging balances and turnover) to measure sales performance across customers and products. View your pipeline of leads, identify new sales opportunities and close more deals on every customer visit. Easily consolidate customer information with sales data and identify what your customers need before they do. Showcase the right product to the right customer at the right time and maximize new orders. Soft1 SFA enables you to visit more customers in less time, sell faster and resolve customer issues, better. Soft1 SFA runs natively on any mobile device so you can instantly access product and customer data, take orders, issue invoices and collect payments, while on the go. Moreover, Soft1 SFA seamlessly supports mobile barcode scanners and mobile printing with Bluetooth connectivity, to facilitate issuing receipts on-site. View all the daily activities, opportunities, sales figures, customer complaints and other metrics used for measuring sales revenue. Generate reports with sale orders broken down by product, lead source, customer and sales representative. Monitor sales KPI’s and analyze the performance of each sales person, on a daily basis. 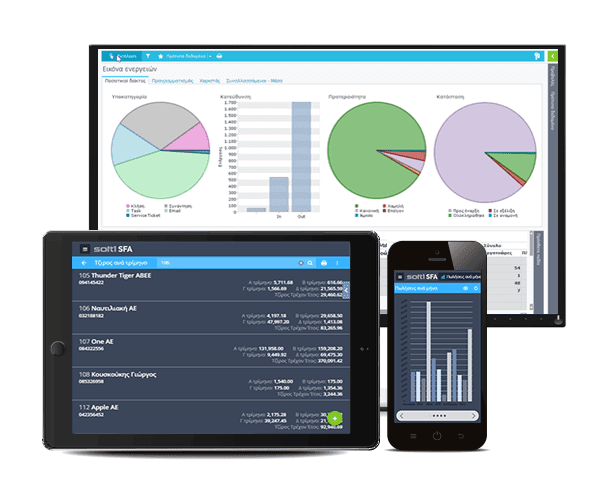 Utilize Soft1’s Series 5 reporting tools and view real-time report boards, graphs and interactive dashboards. Unlock the full potential of your sales team, identifying issues that lead to stalled sales or lost customers. View the lead-to-sales performance, response time and sales efficiencies and focus on maximizing time spent on selling. Evaluate sales opportunities, flag deals of high priority, roll out recommendations to turn more opportunities into revenue, while colsely monitor your competitors' data. Leverage Soft1 SFA data and confidently produce accurate and timely sales forecasts based on real-time figures. Spot and analyze sales pipeline issues and find new ways to move ready-to-buy prospects from one stage to another, ultimately closing more deals faster. Inspire and motivate your sales team with critical sales cycle data and trends and assign key performance targets to optimize your people’s efficiency. Gain valuable insights into the overall sales performance from any device, with a single click. Assess the performance of your resources and the effectiveness of your sales objectives, uncover new insights, evaluate risk and apply process adjustments. With Soft1’s Series 5 advanced analytics capabilities, you can estimate with ease the return on investment of your sales and marketing resources. Soft1 ERP Series 5 extends the value of your sales information, providing you with accurate,real-time cash flow reports. Quickly review and understand your overall performance, converting sales data into valuable insights. Enhance your business visibility and better capture your perspective to drive growth. Make use of Soft1’s Series 5 forecasting tools and make critical projection with confidence. Use Soft1 ERP Series 5 and turn your employee’s activities into data you can use to guide your brand's sales strategy. Gain a solid understanding of how to align your sales strategy with company objectives and monitor team’s performance. Communicate priorities to individuals and teams and make informed decisions about resource allocation, marketing budgets, market segmentation, targeted marketing of new products. View and manage, in real-time, your customers' information and financial standing. Access at any time contact details, order history and schedule optimized routes on Google maps. Create with ease, customer orders and offerings. Receive and register customer payments and issue receipts and invoices. Easily keep track of outstanding orders, slow moving items and aging balance per customer. Seamlessly create and view, per customer, value-analysis reports for goods and services. Easily attach files via Dropbox, including documents, datasheets, photos, videos and more. Organize and prioritize your key activities using Soft1’s SFA friendly calendar and work through your sales activities while on the go. Schedule and manage appointments, set follow-ups and reminders and link individual tasks to visit points. View recent and upcoming appointments and schedule optimized routes on Google maps. Easily link files on a meeting via Dropbox, including documents, photos, videos and more. View in grouped lists all existing products and browse through each one, accessing several product details including descriptions, photos, inventory per storage, suggested wholesale and retail prices. Manage all products and update information fields at any time, from any device. Utilize real-time, role-based dashboards in the form of graphs and widgets that include key metrics such as daily sales orders, sales per item, 4-year comparative customer turnover, outstanding orders, movement of goods, pending customer visits and more. Soft1 SFA supports multiple languages such as Greek, English and Romanian. You can choose the preferred language when signing into the application. Streamline your order processing and easily take orders on any tablet or smartphone. Utilize customer statistics and recommend items for order. Manage any items list using barcode scanners and quickly create purchase orders, selecting products grouped by lot, color, size etc. Obtain electronic signatures per order remotely or in person, using any device. Print customized invoices using Bluetooth printers, cloud printing or Soft1’s fully automated E-Invoicing service. Easily attach files on orders via Dropbox, including documents, datasheets, photos, videos and more. Showcase all of your products on any mobile device, using Soft1’s SFA multiple view e-catalogue. Quickly navigate through products and view related photos and information on units of measurement, wholesale ∧ retail prices, available stock etc. Place orders directly from the showroom, adding selected products into comprehensive e-basket. Capture leads and uncover important insights that you can act on. Import and manage your leads' contact and business details, using Soft1’s SFA standard or customized fields. Forecast expected turnover per lead and track the lead-to-opportunity conversion ratio. Assign actions per lead and easily attach files, orders, documents, photos and videos. Generate accurate financial statements and reports on turnover per customer, total customer takings in cash and banknotes. Monitor and collect data on-shelf inventory and make informed decisions for replenishment to keep shelves stocked. Check and easily register competition prices, manage available questionnaires and carry out on-site merchandise evaluation surveys. Capture pictures of product displays and link them to customer account and store locations. Quickly capture market trends and uncover valuable customer insights, using Soft1’s SFA custom questionnaires. Create and deploy in minutes easy-to-use questionnaires and assess promotions and marketing campaigns, track and manage complaints, measure customer satisfaction and learn more about competition market presence and prices. Create dynamic, comparative reports on turnover per customer, sales orders, sales per product, issued invoices and many more. 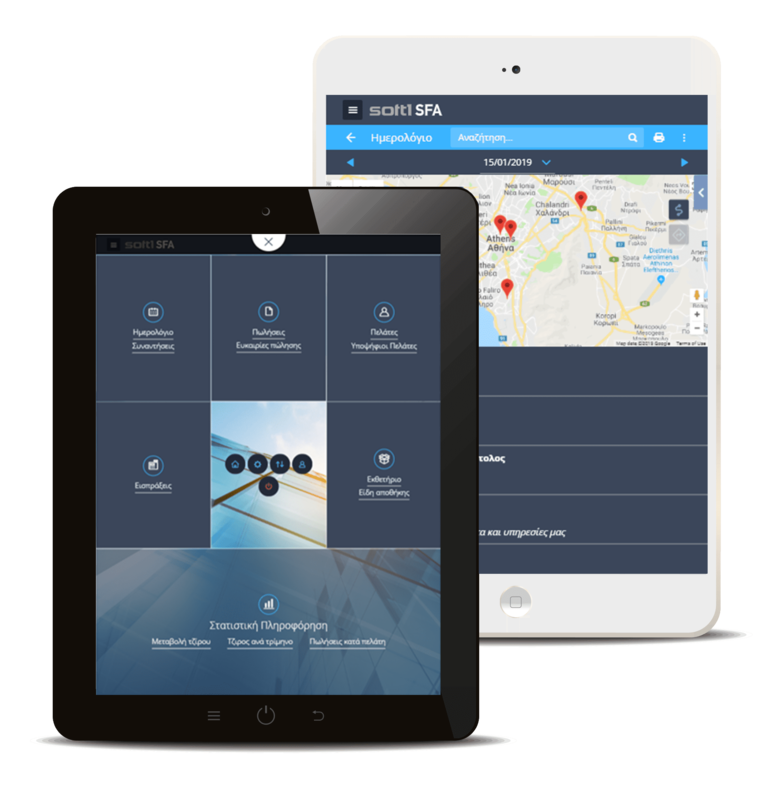 Actions made by Soft1 SFA users, are automatically synchronized with the main Soft1 ERP Series 5, regardless whether the users are online or offline. In addition, users get to choose which data they want to synchronize.